I honestly didn’t know what to expect from Ghost Giant. After viewing the E3 trailer it looked like a game very similar to Moss and in some regards, this is very true though in actual fact this is much more a narrative tale with some light interaction from you to push the story along. The opening moments show a little cat-boy crying and his tears create you, a spectre only the boy can see and while he’s initially afraid of you, soon enough you work together to help him on his emotional journey. The controls here are very job sim-esque with you requiring 2 Move controllers, which act as your hands while you interact with the world around you. Each stage is a stationary affair with you being able to choose from one of 3 viewpoints; 0, 90 and 180 degrees respectively, and must grab or poke whatever is needed to push the story along. In this regard, each stage plays out…well, like a play with you sitting back for a bulk of the conversations until Louie, the boy, requires your assistance. As you advance the story, the stages become puzzles with you having to pay careful attention to what NPC’s may need or looking around the environment for items to help solve those story barriers. Anything made of Brass is of notable importance with you being able to remove panels and roofs or spin around building to see what’s happening inside them. Besides the campaign specific objects, each stage has hidden stuff to play with as well to promote exploring every nook and cranny within your reach like tossing a basketball in a hoop or finding a little bug or a bunch of hats hidden somewhere in the area. Early stages have you pulling dandelions, moving a car, painting a canvas and few other tasks with later stages offering their own unique interactions like operating a crane or magnet. 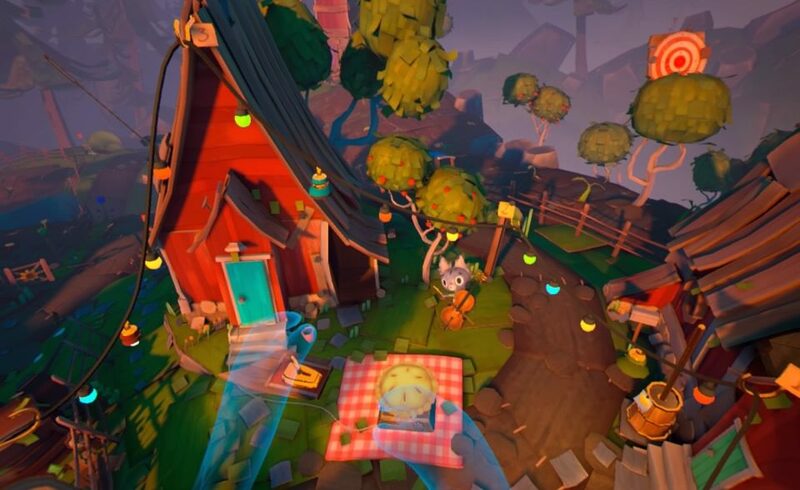 Where Ghost Giant truly shines is its presentation, which is quaint, cute and stunning at times. The stages around you feel like set pieces ripped right from a theatrical release with every one thing carrying a ton of charm and detail. You’ll see a variety of animal characters whom Louie will interact with and each set piece looks wholly unique. From the opening moments near a pond to Louie’s home and the nearby village, each area feels authentic and alive. Whether it’s the creatures hanging around or the animal-people all performing their individual tasks, the level of depth that has gone into this is impressive. The backgrounds go as far as the eye can see and no matter where you look, there is always something happening around you and when you finish a scene, maybe hang around for an extra minute or 2 to see what might happen. It’s not the best-looking VR game out there, but the presentation carries a level of polish we just don’t see enough of. The world has a ton of detail and depth. Perhaps even better then the visuals is the audio which is also top-quality. The voice acting is great and each character, no matter how small their role may be, feels alive. The story is a linear one, but there are many moments when the game has you solving an obstacle while the world still happens around you. People talk to themselves, rarely repeating their lines unless you are stuck in an area for too long or that character is the next step in a stages puzzle and conversations between these NPC’ feels natural, even when some of these characters are a little over the top. The 3D audio is solid with ambient noises and music all adding to the game making it one of the most charming games in recent memory. Despite my praise, I found that Ghost Giant still takes a few missteps. The pacing of the game is intentionally slow with a heavy emphasis on Louie’s plight. The story plays out like a light drama with a few heavy moments centered around sadness and depression. I appreciate the over-arching message and the way it is told, but I just don’t think this will be for everyone. 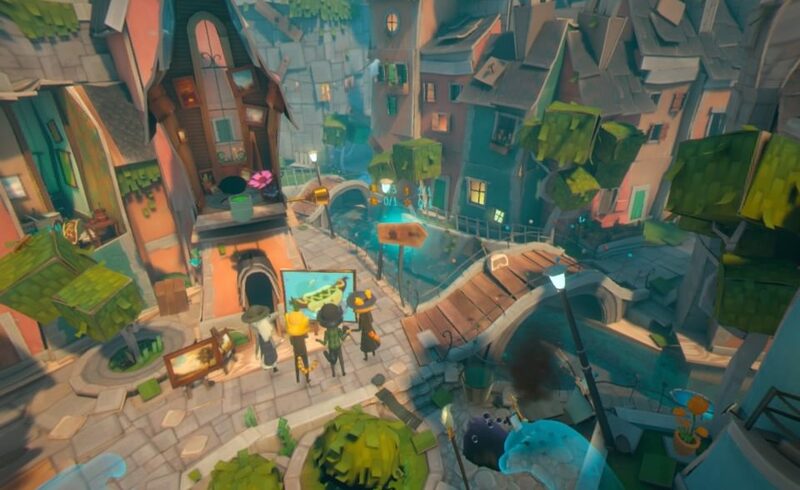 The puzzle solving, though clever at times, mostly devolves into looking around the environment for missing or hidden items making this feel like a game geared toward a younger audience, especially when you consider the art style and protagonist. The story is told very well but I never felt attached to Louie, so I never truly cared about him or his issues, even though I could relate to some of them. It’s a story designed to elicit emotion from the audience, and I think for many it will, but for myself, I never felt fully invested. Each stage feels wholly unique. 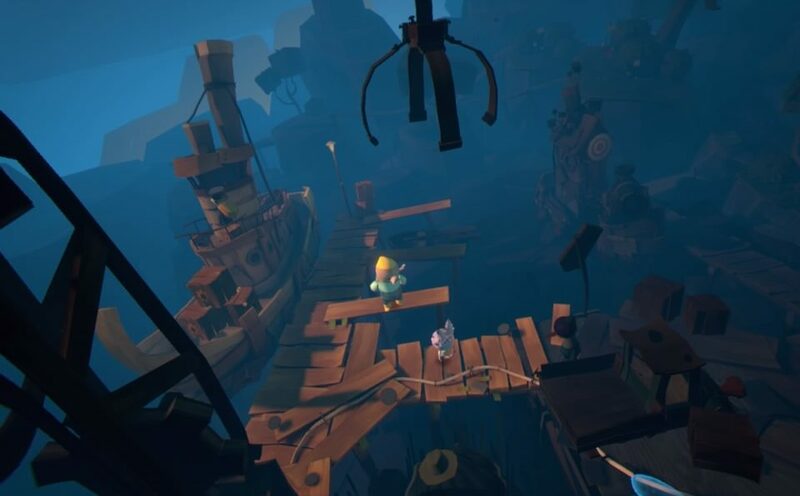 Ghost Giant is a stellar game that will bring you on an emotional journey, assuming the subject matter matters to you. The presentation is near flawless, the performances are fantastic and analyzing any one aspect of the game it’s hard to find any major or even minor issues. If you are a fan of games that address real-world personal issues that aim to pull on your heart strings, then I have no doubt you enjoy the 3-hour(ish) campaign. For those who don’t take satisfaction from emotionally driven games, what’s offered here still is a finely tuned VR experience with some clever puzzles, some funny moments and a well-told story. What would I pay? Despite my misgivings, I still think Ghost Giant is worth the full asking price of $30. I enjoyed the bonus level objectives and everything the game offered up and while I can’t deny that I didn’t care a whole lot about Louie and his journey, I can still appreciate the level of presentation and care that went into creating this game. Zoink Games provided The VR Grid with a review code for this title and, regardless of this review, we thank them for that!